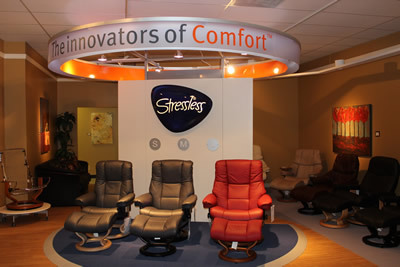 Visit your preferred Stressless Furniture's product page (scroll down this page). Choose your leather/fabric type and color via the pull-down menu. If applicable, choose a wood stain for the base. Have Questions or Prefer to let us do the typing? Drop us a line at 888-486-9463. Check out our "Paloma Specials" for select colors that can instantly save you around 20% on your purchase. Click here to visit the page on our site: [Sofa Specials] Or give us a call at 888-486-9463 to speak with our knowledgeable and friendly Customer Service Team. Enjoy our Safe Shipping options, including White Glove Delivery, on all Stressless Sofas. If you are looking for Sectional Furniture and/or Home Theater Seating follow these links: Stressless Sectionals or Stressless Home Theater. Call 1-888-486-9463, click the chat button or email stressless@unwind.com to connect with a Stressless Specialist.